On January 24, a group of Delaware North Companies (DNC) Parks & Resorts at Yosemite employees traveled to the Mariposa County Fairgrounds to accept the 2012 “Business of the Year” Award from the Mariposa County Chamber of Commerce. 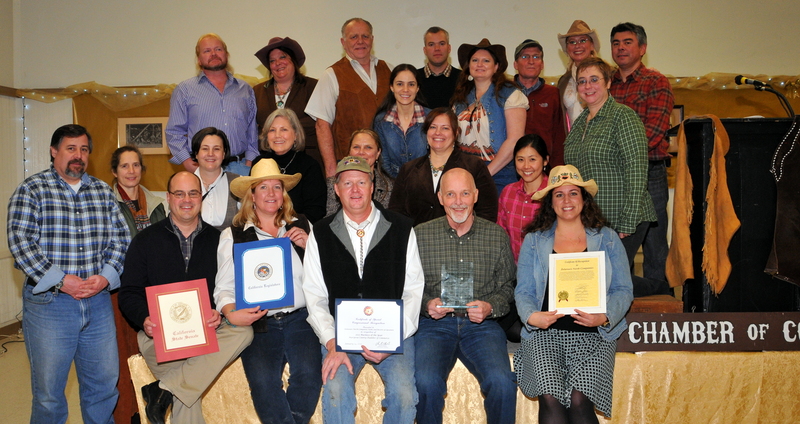 The western-themed awards dinner recognized individuals and organizations that made a big impact on the community of Mariposa in the past year. The Mariposa County Chamber of Commerce also recognized Ron Iudice from the California Mining and Mineral Museum as Businessman of the Year. Karen Cutter of Ladybug Embroidery was named Businesswoman of the Year and the organization, SCOPE (Sheriff’s Community-Organized Policing Effort) was recognized as Volunteer of the Year for all of their service, from managing parade-day traffic to family safety programs.